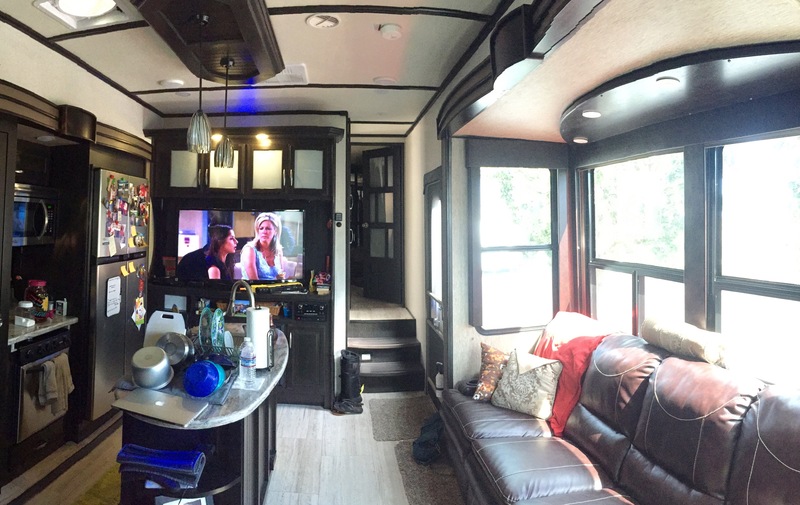 The layout of the main living area in our camper is just about perfect for us. 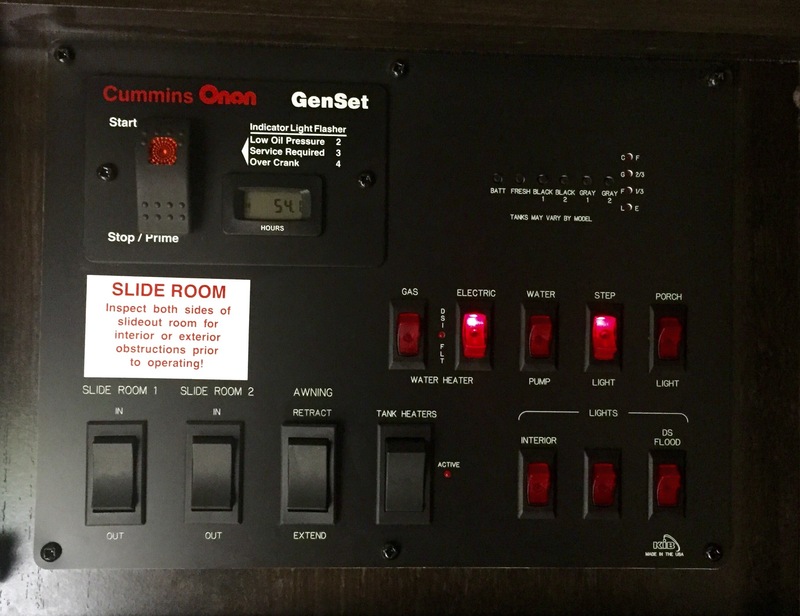 It has opposing slides, which open up the space a lot. Also, the ceilings being so high help with that. (We are 13’6″ high.) Some images I’ve taken from Grand Design‘s website and some are my own. I really wanted an island when we were looking at new campers. Not only does it add counter space (which in campers, is always at a minimum) but it also let’s me have a conversation with Allen when I’m prepping dinner or my least favorite chore: washing dishes, which he doesn’t do nearly enough of, IMHO. 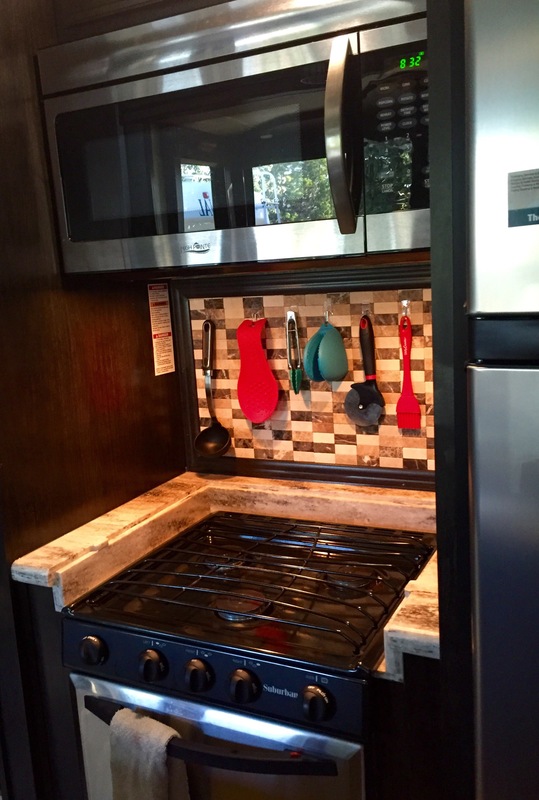 The island in our Grand Design Momentum has a marble looking top and double basin sink with sink covers. 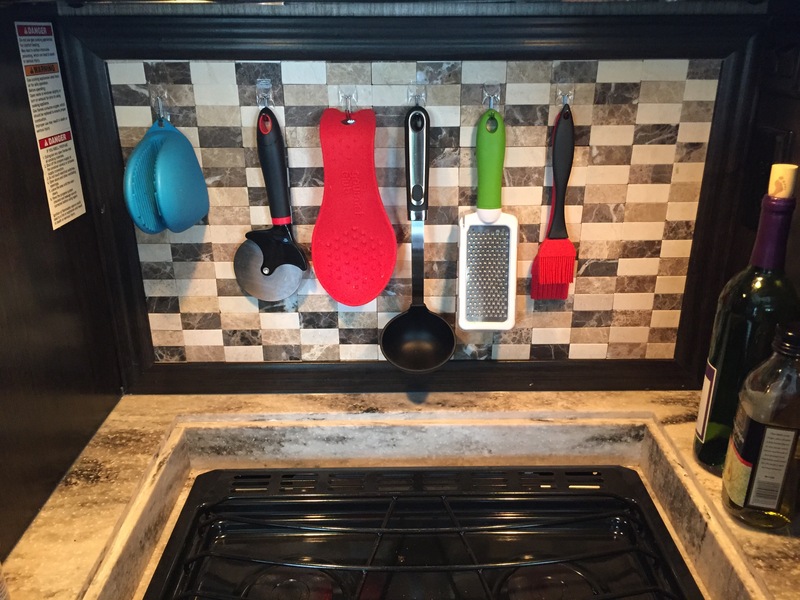 We usually keep the smaller side covered, adding even more counter space. The faucet has a sprayer that pulls down so you can rinse the whole sink. Under the sink there is room for a small trash can on one side and two shelves on the other. Next to those cabinet doors are three drawers. There are three shelves on either side of the island with blue LED lights under them and outlets on both sides as well. Directly above the island are two chandelier lights that hang down and add a nice touch that I haven’t seen too often in campers. 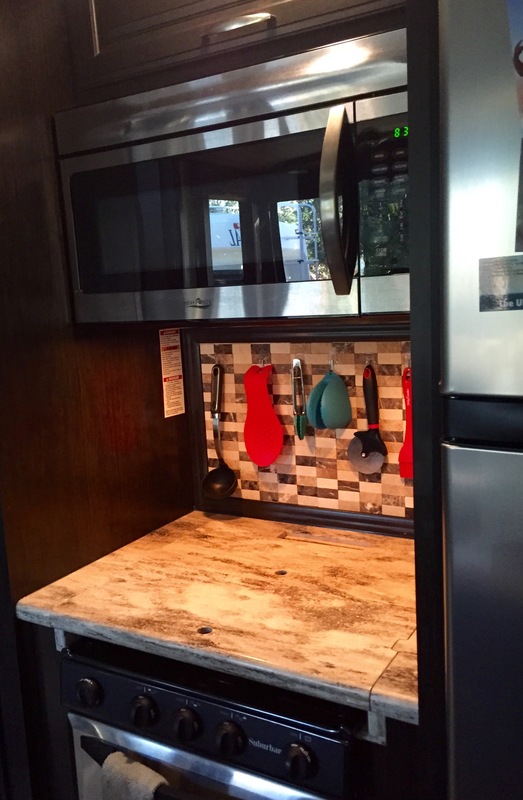 In the kitchen slide, there is a large pantry with 3 shelves and 3 drawers, an oven and stove- with stove covers that match the island, a storage drawer underneath the stove, a marble looking backsplash, a convection microwave above, and another storage cabinet above that. The stove WITH the covers on. The stove WITHOUT the covers. 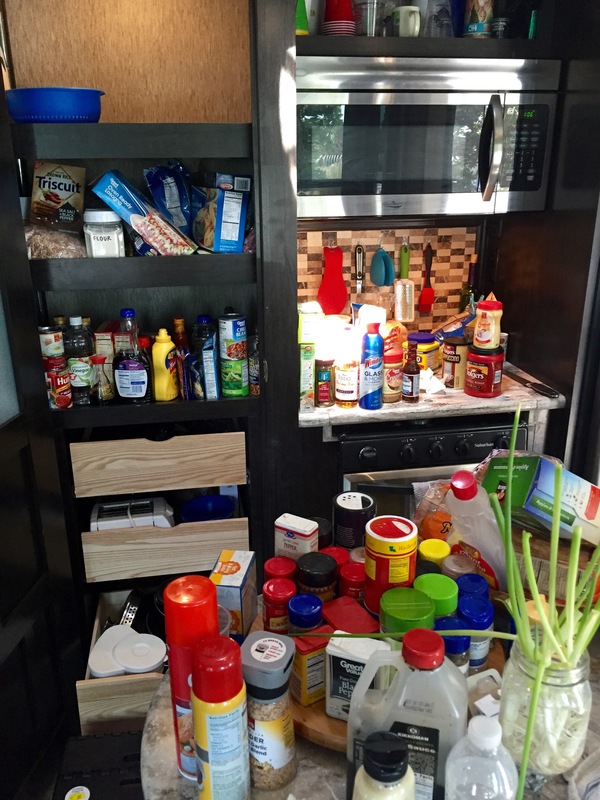 This would be my attempt at organizing the pantry… for probably the third time… yikes! 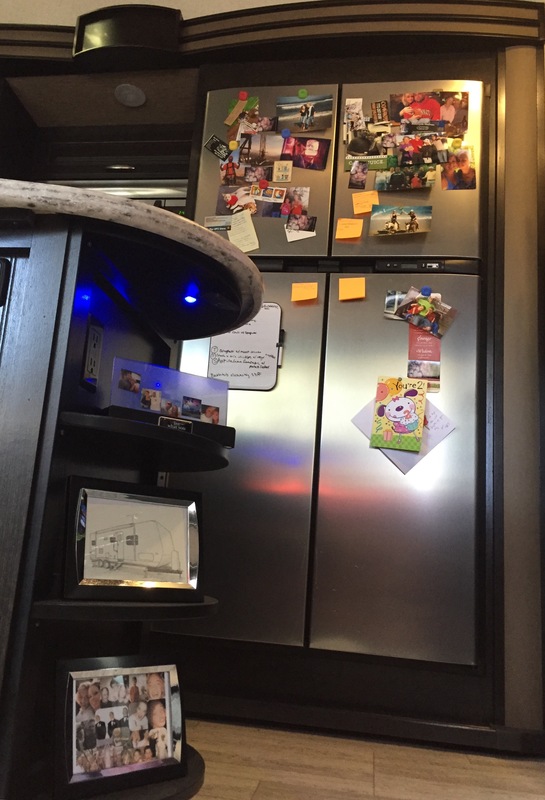 I think I might be overly excited about the magnetic fridge…It’s getting quite cluttered. And I’ve been on a post-it note kick lately so those are stuck everywhere! That’s our Bug-A-Salt rifle sitting under the TV. It’s pretty awesome! Across from the kitchen is the other slide that holds the couch, 4 theater style seats. They all recline all the way back. The two end seats have cup holders, massage, and heat. 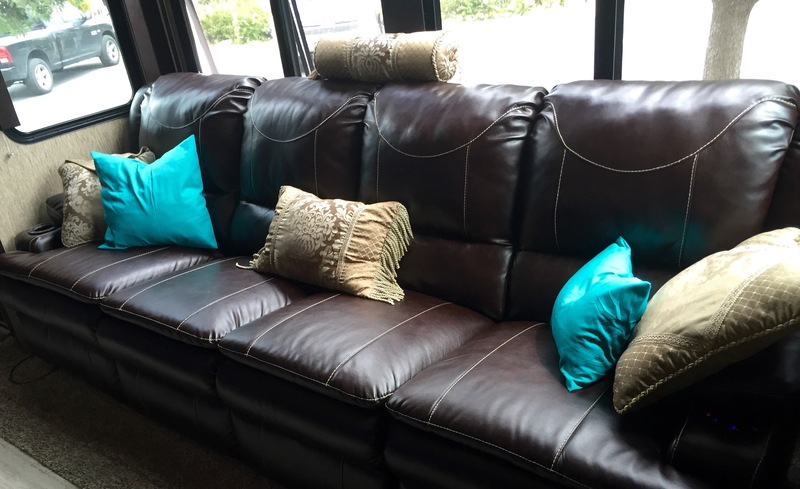 There are blue LED lights under the couch also. There are huge picture windows behind and on either side of the couch, letting lots of light and fresh air in, which I love! We have a table that matches the countertops that we can set up in front of the couch if we want to eat in the living room. We’ve only done that a few times though. You can get to the garage through a glass door and to the half-bath from the living room. There is a loft bed on top of the bath, that has a pull out ladder to get up to it. There is another vent hatch with a fan up there and a window (just for light, it doesn’t open). Currently we just use that space for storage. We keep our out-of-season clothes in Ziploc Space Saver bags (I love those things). Luckily for us, and Allen’s OCD tendencies, the loft came with a curtain that slides across and covers all that. Some sensors I DO trust because I know they work are the smoke alarm and propane alarm! Allen set the smoke alarm off the first time he made breakfast for us, and set the propane alarm off because he insisted on spraying sunscreen on me INSIDE! One thing I do want to mention that I love about this camper is that when we are traveling, and stop at a rest stop or what not, I can get to the bathroom and one side of the fridge. In our old camper we had to open the slide to get to the bathroom. And in order to be able to crack the fridge open enough to grab a soda, we had to climb over the couch. So I really like this part. I’ll start with the HDMI cord. After waiting weeks for my buddy Jerry in the warranty department to get us a replacement HDMI cord, we discovered that all of the cords running between the TV and speakers and CD player are all enclosed in the entertainment center hutch thing. So Allen tried to attach the new cord to the old one and pull it through. Well, there’s some tiny holes it runs through inside the entertainment center that we couldn’t get to. 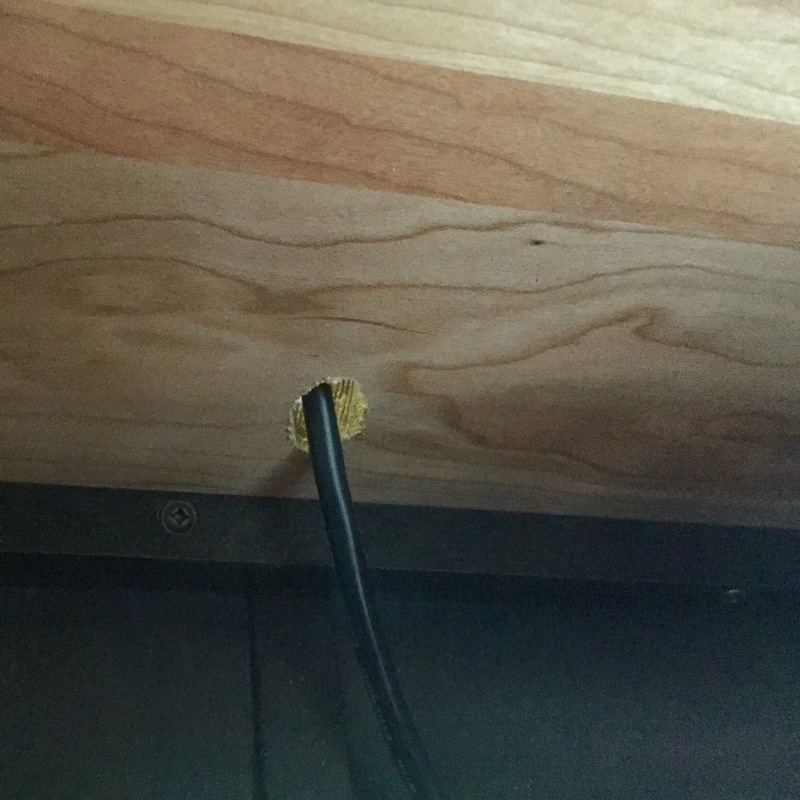 So he wound up cutting a small hole and running the cord up behind the TV. It doesn’t look bad at all. Plus it’s behind the TV. Still, one of those annoying little things that come with all new campers. 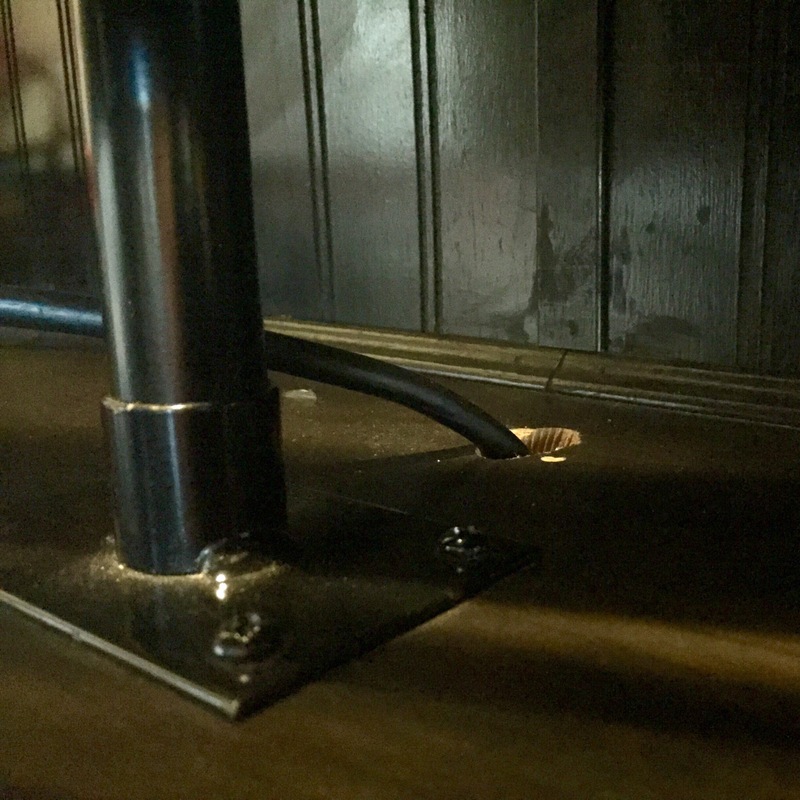 This is right behind the pole that the TV is attached to. And this is underneath, you can’t see it. 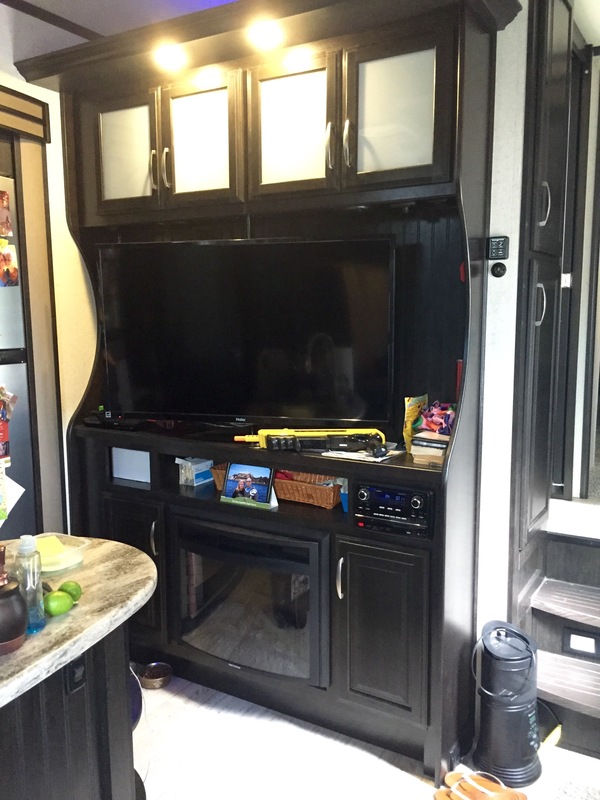 This entry was posted in 2015 Grand Design Momentum 385TH, Camper, RV, Traveling and tagged 5th wheel, blogging101, camper, camping, DIY, fifth wheel, Grand Design, home, kitchen, living room, Momentum, RV, RVing, tour, travel, traveling by Rachel Gillen. Bookmark the permalink. Thank you so much! 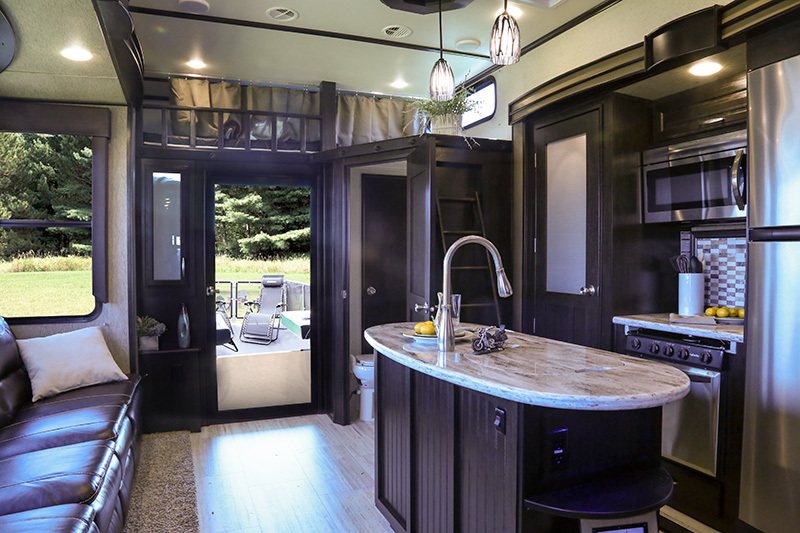 We have a fifth wheel, it’s a kind of travel trailer you pull with a truck. Oh that’s pretty incredible. I’ve just seen a caravan once; it’s really small. This one’s got a good amount of space!